Click to enlarge via Flickr. Left: front view at the 2013 Francaise Dinner. Right: side view. Notes: Made December 2012-March 2013. Sewn by hand except the long seam in the skirt. 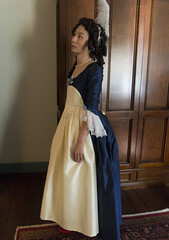 The sleeve ruffles were purchased from Fashions Revisited.